It has happened, I’m in my mid 30s and I’m starting to see wrinkles, acne pop up (okay, that’s been a constant issue) and dark spots appear. I’ve never had the best skin growing up, but I’d go through phases where it would look great and then be bad all of a sudden. I never really got into skincare, serums, lotions, potions, magic creams, etc. Until now. 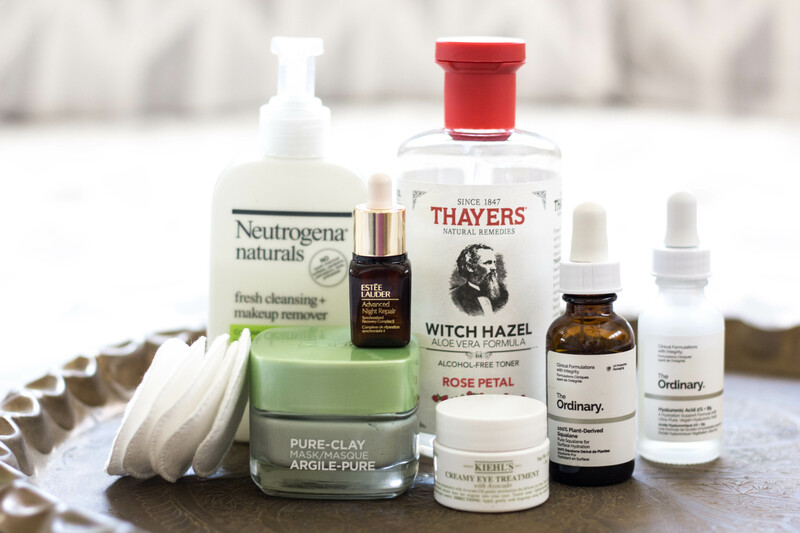 I follow a couple of beauty bloggers on Instagram and really got into the products they were using for their nighttime skincare routine. I figured it couldn’t hurt for my skin, so I went down the rabbit hole of skincare products. 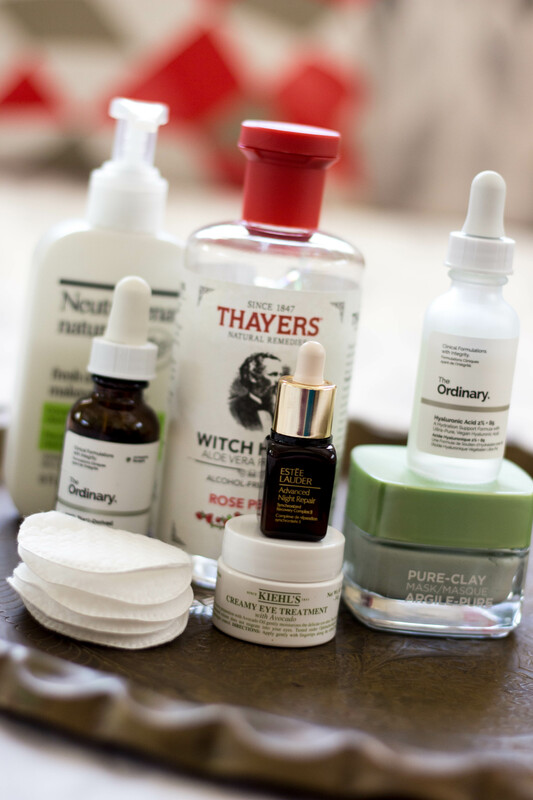 I read a million reviews specifically looking for ones that would irritate my skin. I wouldn’t say I have super sensitive skin, but as I mentioned it does like to breakout from time to time, and I didn’t want to have any kind of flare up. Now, obviously, I am no beauty blogger. I’m sure I’m doing something wrong, putting some serum on in the wrong order, but for me, the results have been great. And I wanted to share the regimen with you incase you need a little skincare update yourself! I have been using this product the longest. It’s actually one of the only things I’d been using consistently over the years. 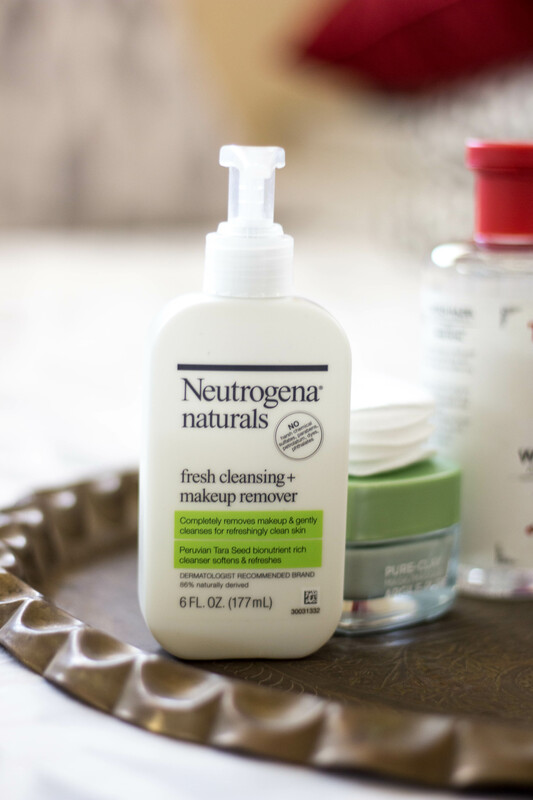 I use it every evening and morning to wash away my makeup and any other grime that’s gotten on my face (can we say airline travel!). It’s very gentle and has a super light, fresh scent. Even better you can find it at any drugstore, Target or even grocery stores for under $10. 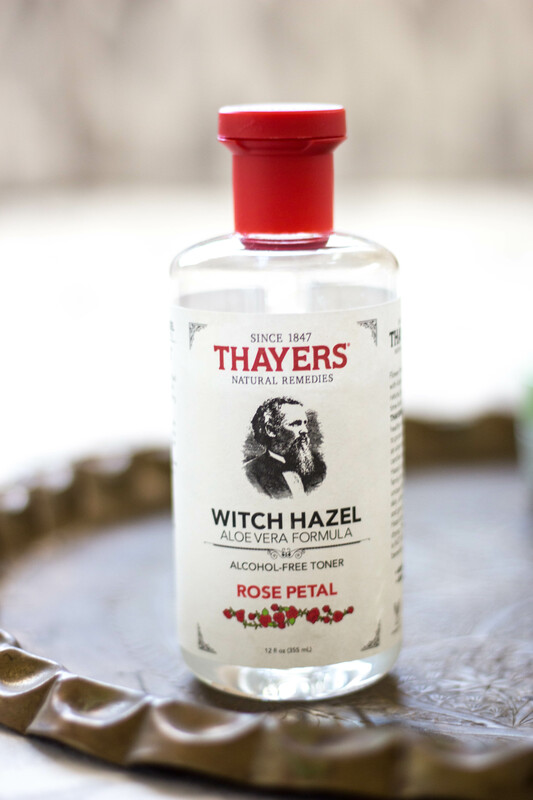 After a ton of research this toner kept popping up with amazing reviews. I haven’t used a toner in probably 10+ years, so if I was going to add one to my routine it better make a difference and not bother my skin. This has worked amazing. And even more so, it has a ton of reviews that mention it works to clear up acne. Um, sign me up (also, where have you been all of my life?!). I use this right after the cleanser and it leaves your face clean, prepped and doesn’t dry it out. And again, drugstore purchase. I got this one from Target for under $10. Proof that you don’t have to spend a lot of money on fancy products to get great results. Serums are something I have absolutely zero clue about. Thank goodness I’m a researcher. I’ve read beauty blogs, prominent beauty websites, articles, watched youtube videos and probably more that I can’t even think of right now to figure out what in the world kind of serum would be good for my skin. The problem (that’s not really a problem) is everyone’s skin is different. And when you go to look for a serum, you’ll come to realize this. 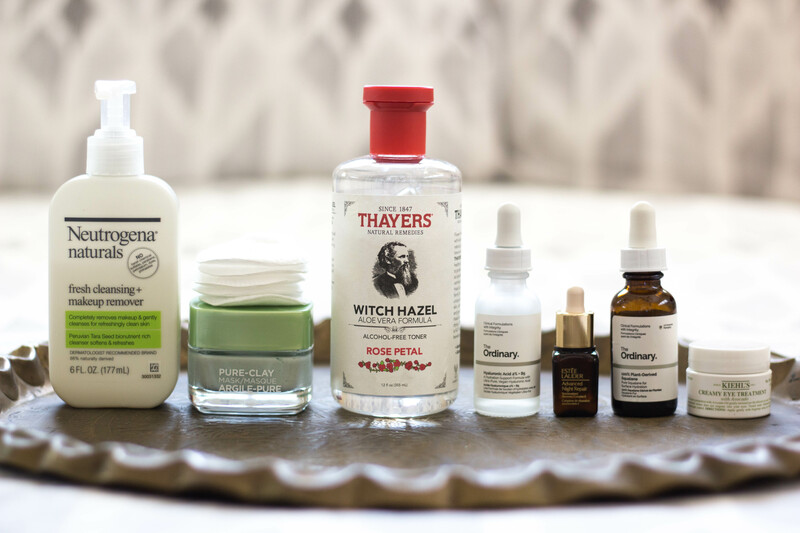 Looking for a serum is like going to the grocery store cereal aisle. There are one million choices, they all look good, they all have different ingredients, and you’re overwhelmed by which to choose. Here’s how I came to choose these two. I found a product line/company that was a good price (I didn’t want to spend a ton on a product I knew nothing about), but also has great reviews. 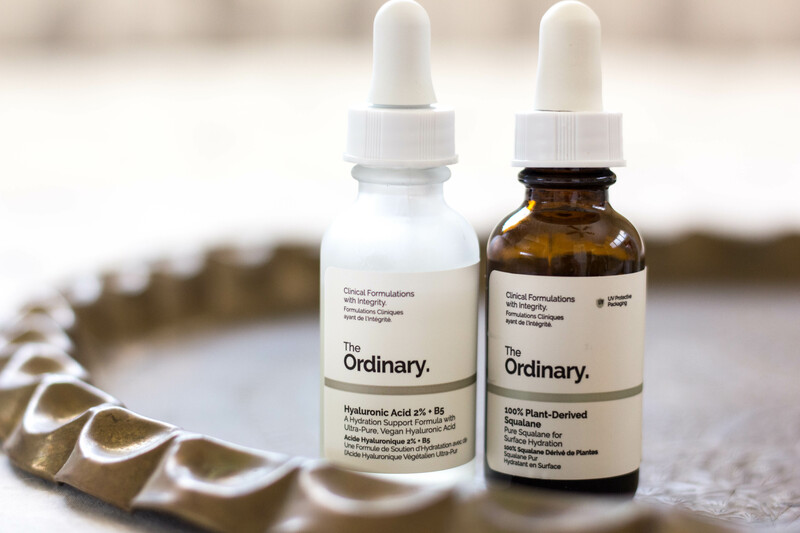 If you haven’t heard of the The Ordinary, you need to check them out. They have a plethora of products and you’ll be shocked at their price tag. It’s sold at a lot of places you already shop at – Nordstrom, Sephora, Beautylish, etc. so it’s not like it’s a rare find, maybe more just a unique find. Now…how did I narrow down what I needed? Think of what you’re trying to get your skin to accomplish. I wanted blemish free (or as close to it as possible), hydration and anti-aging. 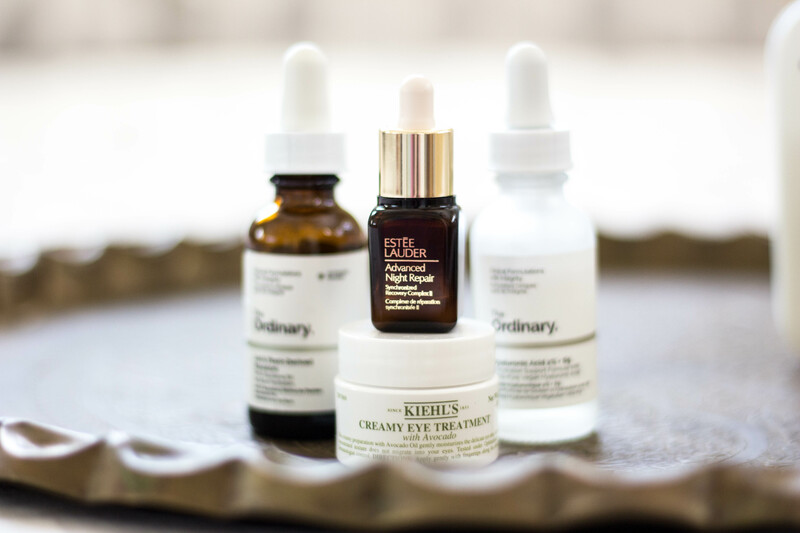 After my extensive research I found a few of the serums that I could choose from that had great reviews, but were accomplishing my goals to great skin. First one was Hyaluronic Acid 2% + B5. Hyaluronic Acid (HA) is something your skin already produces for surface hydration, but it doesn’t really penetrate your skin. This formula uses a combination and really hydrates and plumps. I use this right after the toner. It goes on slightly sticky, but dries within seconds. The next serum is the 100% Plant -Derived Squalane. This is the last serum I use in my routine. It also is an ingredient that is found in the skin already, but as you get older your skin doesn’t produce as much as it used to. This serum is great for hydration and to achieve a soft, smooth surface. With regular use it can prevent moisture loss. It can also be used on your hair to add shine (what? dual purpose?! yes please!). I have to admit I was a little scared of this one at first because it’s an oil. I always thought oil cannot be good for acne-prone skin, but I was wrong. Because this is lightweight and fast-absorbing and something the skin already produces, I haven’t had any issues with it. The middle step between the Hyaluronic Acid and the Squalane is this Estee Lauder product. The reviews on it are out of control (think 5 stars out of 3,000 reviews!! ), so I knew I wanted to try it, but it is also one of the most expensive items in my skincare routine, so I was super excited to find a travel size version. As a side note, I always will look to see if they have a travel size version of new items before I buy the full product. If your skin is sensitive like mine, it’ll save you a ton of money! This serum restores moisture (you can never have enough!) and radiance. It also helps reduce the signs of aging. Now, this does include Hyaluronic Acid in it’s ingredient list, but because it has other ingredients that do different things I figure it can’t hurt to have both. This serum goes on smooth, but slightly sticky. I rub this all over my face and neck and let it really soak in before I put on the Squalane oil. It dries within seconds. The last step in my skincare routine is a good eye cream. I’ll be honest, I haven’t found one that I’m absolutely in love with. 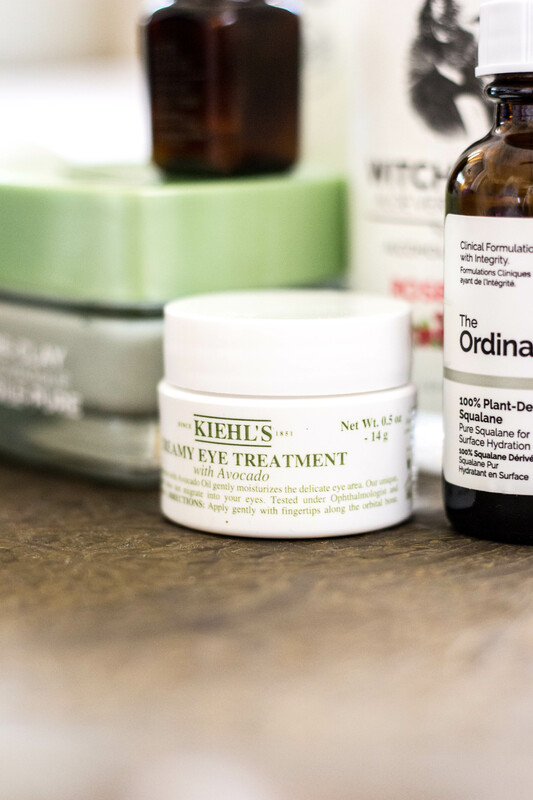 I like this Kiehls one because it delivers really good moisture under and around the eye, and if you haven’t experienced it yet, that was one of the first places I noticed aging (eek!). While the container seems fairly small, you only need a small amount each night (you can also incorporate this into your morning routine!). I take my middle finger and just dab underneath my eye, around the sides and then sometimes in the lid crease. You can definitely tell a difference in the texture of the skin in the morning after using this around your eyes. I’m still on the lookout though for something to help with fine lines and aging so if you have any suggestions, put them in the comments below! A couple of others I have tried are: Perricone MD – Firming eye cream and Estee Lauder – Advanced Night Repair Eye. Both of those are pricey and while I did notice a plumpness in my eye skin from the Perricone MD one it wasn’t enough to pay the $72 price tag. I don’t use this mask as much as I probably should, but I use it every time my skin is feeling a little off. Usually around my girly time of the month or after traveling or if I’ve been stressed out for some reason. Over the years I’ve tried a good variety of masks from expensive ones to drugstore finds and this one is by far my favorite. Because I use all of the serums listed above for hydration, I don’t usually need a mask that will give me that. I’m looking for something that will draw out the impurities and leave my skin feeling clean and fresh. This mask does just that and is only $13. And even for that reasonable price, it will last you awhile (I use about once every 2 weeks and I’ve had it for about 4 months). I spread on a thin layer with my fingers and let it dry for about 15 minutes (It has great spa like smell to it). And then I wash it off with warm water and a wash cloth. I haven’t had any tingling or burning sensation with this mask, it just gets really tight as it dries. My skin feels amazing after I use it: very clean and glowing. Well, there you have it, my full nighttime skincare routine. If you’ve read all the way through this routine, I’m impressed, it’s lengthy. Overall, it only takes me about 10 minutes (if that) to put it on at night and if it helps my skin stay looking great, I’m all for it. I can spare 10 minutes. 🙂 If you have any questions, comments, insight or advice, feel free to place it in the comments below. As I mentioned, I’m no beauty expert, so I could be putting things on in the wrong order, missing out on a product or not giving the best description of what the product does, but it works for me, and has been for over 6 months, so I must be doing something right! Hope this helps you guys too!! 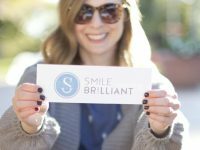 Teeth Whitening at Home – Smile Brilliant Review & Giveaway!